Pushkin Public Relations is a public relations firm located in Denver, Colorado. Providing Colorado with public relations services such as media relations, media placement, strategic planning, and community relations. That essential law of gravity is very apparent during a crisis. Just ask the owners of the New York Mets, who are facing a $1 billion lawsuit that claims they illegally profited from Bernie Madoff’s investments just two years after New York celebrated them for opening the Mets new stadium, Citi Field. 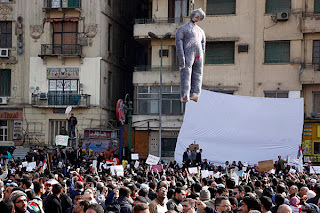 Or as Hosni Mubarak might say, “don’t ask.” Anytime you are being burned in effigy you have a major problem on your hands. To everything there is a season and you never know when the tide will turn. Crises come in all kinds of shapes and sizes. They can be serious and drawn out, like the BP oil spill. Or they can be less serious and shorter-term like a negative TV story. It can make you look bad but it usually doesn’t make you lose you shirt or your life. The most important thing you can do to manage a crisis is to prepare for it ahead of time. That means having a plan in place that anticipates what could happen and how you would deal with it if it does. Unfortunately, most organizations don’t plan ahead. They wait until the investigative reporter ambushes them in the parking lot before they contact a PR firm to put out the fire. That may ultimately save the building but not your prized possessions. Gather your team and determine what kinds of potential situations can harm your reputation. Identify everything from a tornado to a disgruntled employee going to the press, to workplace domestic violence, to an angry customer talking about you on Facebook. Talk about how you would handle each situation. What resources would you need? Who would be your spokesperson? What stakeholder groups would you need to contact? How would your team communicate both internally and externally? Draft a plan that outlines these scenarios, assigns responsibilities and designates the steps you would take in each situation. Make sure that top management signs off on the plan and buys into it. It is critical that they take it seriously. Organize drills to help you practice these steps so that if a real crisis happens you will feel prepared and ready to handle it. Don’t wait until the hounds are at your door to call for reinforcements. Plan ahead so when the ball comes down you’ll be ready to catch it. Like the Boy Scouts, always be prepared. You may not always escape injury but you will surely improve your odds of survival. Denver Public Relations is a blog site developed by public relations expert, Jon Pushkin, owner of Pushkin Public Relations. Copyright © 2011 Denver Public Relations: Pushkin PR All rights reserved.